Tonight, I decided to get some practice. My eyebrows have been a bit of a touchy area. My thyroid went unregulated for many years, so my eyebrows are sparse toward the outside ends. My boyfriend sometimes teases me for my thin eyebrows, but his are thick and shapely. I love my eyes, but I feel like I need to do something about my glasses if I’m going to express myself through eye makeup. My cheeks are also really pink and the skin around my mouth is very olive, then there are the dark circles under my eyes. I’ve got this rainbow happening, so picking a foundation wasn’t easy. I also had an idea what I wanted as a brow pencil before I got to the store, but found no such shade. My pencils at home were all too orange from when I dyed my hair red-brown, but my hair is a darker ash brown. The foundation and powder worked out well. Eyebrows are okay. Cheeks and lips could use some work, but I’m still a little timid about them. For tonight’s exercise, I used a lip stain, because I hate the way lipstick feels. I didn’t want to go too dramatic with the lips either. The darker the lips, the smaller my mouth seems, an the bigger my cheeks look. This was good practice and I had fun. I think the most expensive thing was the brow pencil from L’Oreal. It’s a dual pencil with finishing wax on the other end. Everything else was pretty cheap. 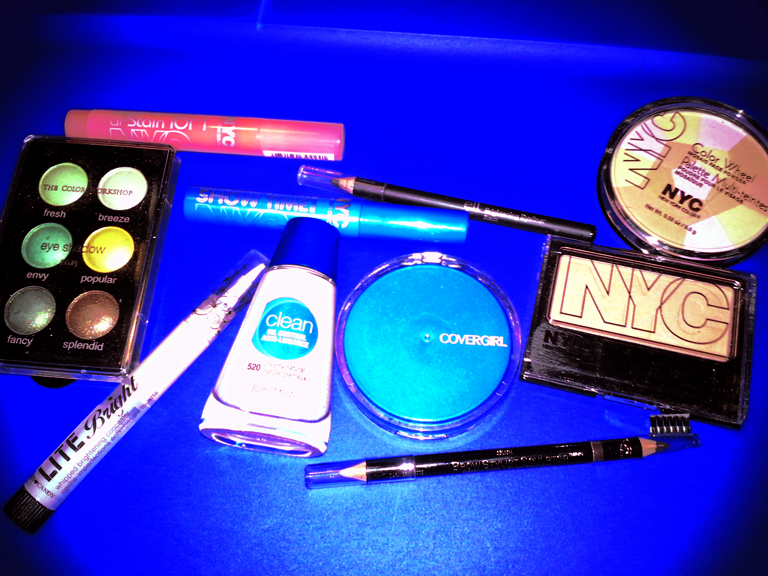 I’ve got some Covergirl, NYC, Hard Candy, e.l.f., and Color Workshop. The Hard Candy Lite Bright concealer showed promise, but wasn’t great. The click stick either didn’t put out enough or put out way too much, and the built-in applicator brush was a bit stiff for smooth coverage. I felt like I was actually going to make my dark circles worse by using it, so I opted for a softer hair brush. 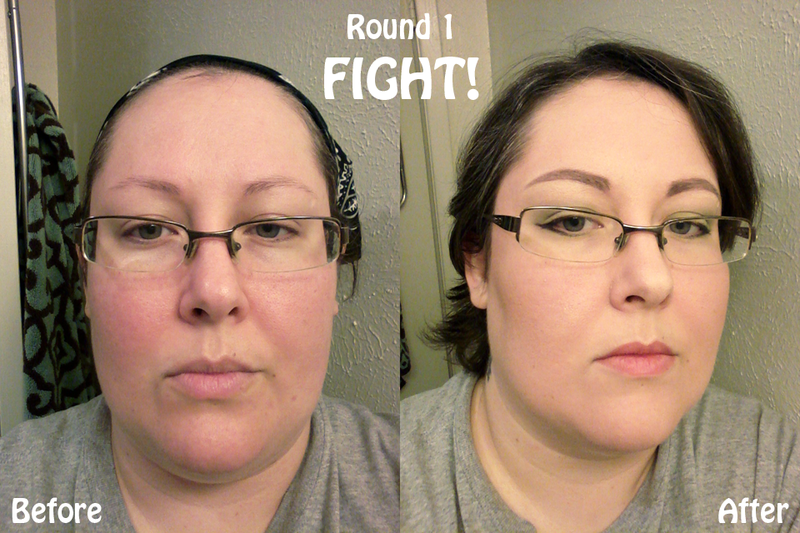 So, for someone who has worn makeup outside the house maybe once in the last year, how’d I do? It’s going to take a lot of work and practice to be up to snuff with the rest of these internet lovelies, but that’s why we’re here. I don’t care if you’re here in hopes of watching me fail miserably, or you’re here to see me succeed because you need a reason to believe you can do it too. Point is, you’re still here. Thank you! You are good with that eyeliner! Thank you 🙂 It’s a battle, because my hands aren’t super steady and my eyelids flutter. This one turned out alright. Yes. I was diagnosed with Hashimoto’s when I was a teenager. Without medication back then, I had a resting pulse of 120. They put me on propranolol until my thyroid got tired of cranking out hormones, and I was fine for several years. Now I take levothyroxine because my thyroid isn’t working on its own. Do you have any ideas if your thyroid is shrunk now and become a scar tissue (aka thyroid atrophy) or it remains larger than average size and has nodules? It still functions, just not enough to keep an entire adult body going on its own, and it’s not enlarged. The doctor feels for swelling and nodules, at each checkup, but it’s just the size of a regular thyroid.